Background: Mitochondrial dysfunction occurs early in the course of ALS, and the mitochondria may be an important site for therapeutic intervention. Creatine stabilizes the mitochondrial transition pore, and is important in mitochondrial ATP production. In a transgenic mouse model of ALS, administration of creatine prolongs survival and preserves motor function and motor neurons. Methods: The authors conducted a randomized double-blind, placebo controlled trial on 104 patients with ALS from 14 sites to evaluate the efficacy of creatine supplementation in ALS. The primary outcome measure was maximum voluntary isometric contraction of eight upper extremity muscles, with secondary outcomes including grip strength, ALS Functional Rating Scale–Revised, and motor unit number estimates. Patients were treated for 6 months, and evaluated monthly. Results: Creatine was tolerated well, but no benefit of creatine could be demonstrated in any outcome measure. CI analysis showed that the study, although powered to detect a 50% or greater change in rate of decline of muscle strength, actually made an effect size of greater than 23% unlikely. It was also demonstrated that motor unit number estimation was performed with acceptable reproducibility and tolerability, and may be a useful outcome measure in future clinical trials. Conclusion: Any beneficial effect of creatine at 5 g per day in ALS must be small. Other agents should be considered in future studies of therapeutic agents to address mitochondrial dysfunction in ALS. In addition, motor unit number estimation may be a useful outcome measure for future clinical trials in ALS. Since the first demonstration that the course of ALS could be altered by pharmacologic therapy,1 much has been learned about its pathogenesis. A clear relationship has been established between abnormalities in glutamate transport and ALS-specific motor neuron death.2,3⇓ Oxidative stress4,5⇓ also contributes to neuronal death both in sporadic and familial ALS. Neurofilament aggregation, production, and degradation is abnormal as well.6–8⇓⇓ All of these potential disease mechanisms provide targets for disease intervention; however, although promising therapeutic results have been reported in animal models, no additional agent has been demonstrated to be effective in human disease. The role of mitochondrial dysfunction in ALS has also been investigated, and it appears likely that abnormalities in this cytoplasmic organelle appear quite early in the disease course. Morphologic studies have demonstrated mitochondrial abnormalities in both neural and non-neural tissue from patients with sporadic ALS, including in otherwise normal appearing corticomotor neurons.9–12⇓⇓⇓ The most prevalent mitochondrial DNA mutation in elderly humans is strongly associated with sporadic ALS.13 In transgenic mice bearing a human point mutation in SOD1 causing familial ALS (fALS mice), mitochondrial changes are an early and prominent feature. Mitochondrial swelling and vacuolization are seen prior to symptom onset in two strains of fALS mice.14–17⇓⇓⇓ Prior to disease onset, abundant abnormal mitochondria were noted in motor axons from fALS mice. Disease onset correlated with massive mitochondrial vacuolation, which decreased as disease progressed. Motor axons remained viable, however, until well after the development of weakness. Creatine treatment, either alone or in combination with other drugs, prolongs life in the fALS mouse. 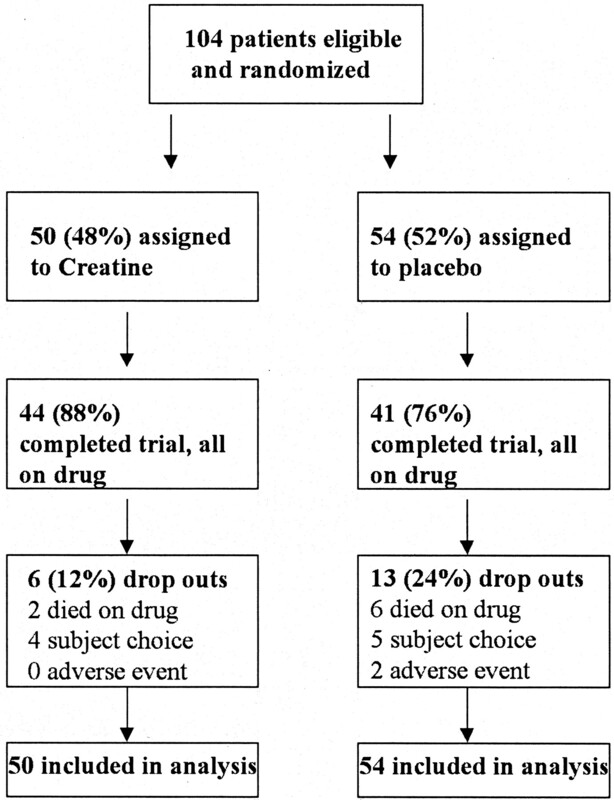 When given prior to disease onset, a dose-related increase in survival of up to 26 days was noted.23 In combination with other agents known to have a beneficial effect in this model, creatine treatment was additive in some cases24 but not others.25 Based on these data, we conducted a randomized, placebo-controlled trial of creatine in patients with ALS. During the course of this trial, results of another creatine study were reported in which patients with ALS treated with creatine at 10 g per day failed to show benefit.26 However, given the strength of the preclinical data, in addition to the fact that our study evaluated a different dose, using somewhat different outcome measures, the decision was made to continue the trial to its conclusion. This study was performed by members of the Northeast ALS clinical trials consortium. A randomized, double-blind, placebo-controlled trial design was used. The institutional review boards of each of the participating institutions approved the protocol and consent forms. Eligible subjects were randomized in a 1:1 fashion to receive treatment for 6 months with creatine monohydrate (supplied by Avicena Group) at a dose of 20 g per day for 5 days followed by 5 g per day, or matching placebo. Randomization accomplished using a random number generator at the coordination center was stratified by clinical center, as well as blocked to ensure that the treatment groups were balanced within a site. The study duration was chosen to encourage patient recruitment, as creatine is readily available without prescription. The coordination center staff, all site investigators, coordinators, and clinical evaluators, were blind to treatment assignment throughout the study. An independent safety monitoring committee (SMC) reviewed the safety data every 3 months throughout the study. The SMC had the ability to recommend modifying or stopping the trial if they judged that subjects’ safety was being jeopardized. Eligible participants, 18 to 80 years of age, had a clinical diagnosis of definite or probable ALS,27 a FVC greater than or equal to 50% predicted, and disease duration less than or equal to 5 years. Upper extremity strength had to be sufficient so that at least four of eight muscle groups could be evaluated using the quantitative isometric strength apparatus. Patients were excluded if they had taken other investigational drugs, including creatine, in the preceding 4 weeks. All eligible patients seen at the study sites during the enrollment period were offered the opportunity to participate in the study. Subjects could take riluzole if the dose was stable for at least 2 months prior to the baseline visit. Subjects were not allowed to change the dosage of riluzole during the trial. At the screening visit, the study design was explained to all prospective participants, and informed consent was obtained. Screening procedures included assessment of eligibility criteria, signing of the consent form, a complete medical history, general physical examination, FVC determination, vital signs, medication review, screening safety panel (BUN, creatinine, and urinalysis), and urine creatine levels. Urinary creatine was measured from aliquots of 24 hour urine samples, which subjects collected on the day prior to their screening visit. Before initiation of study medication, muscle strength was tested in 8 arm muscles using maximum voluntary isometric contraction (MVIC).28–30⇓⇓ Raw scores for MVIC were standardized to published norms using Z-score transformation (raw score minus norm average divided by norm SD). Forced vital capacity, grip strength, and the ALS Functional Rating Scale (ALSFRS-R)31,32⇓ were also measured. The ALSFRS-R is a quickly administered ordinal rating scale used to determine patients’ assessment of their capability and independence in functional activities relevant to ALS. Motor unit number estimation (MUNE) using a modification of the statistical method33–36⇓⇓⇓ was also performed on one of four intrinsic hand muscles (bilateral abductor pollicis brevis [APB] or abductor digit minimi [ADM]). The choice of hand muscle was determined by clinical evaluation, with the goal of studying a muscle that was mildly affected. Thus, for subjects with weak hands, the strongest muscle was chosen, while the weakest muscle was employed in subjects whose hands were near normal in strength. The statistical technique was modified to aid in reproducibility throughout centers, and to ensure that large motor units that characterize muscles in ALS patients were accurately accounted for. Thus, a protocol was established to identify all large motor units whose amplitude was greater than 10% of the maximum compound muscle action potential (CMAP) amplitude. In addition, motor unit size was evaluated at predefined response levels. Because studies in normal subjects by site clinical neurophysiologists demonstrated that less than 2% of motor units were of less than 40 μV in amplitude, units of this size or smaller were excluded for evaluation in ALS patients. Prior to any site enrolling patients into this trial, formal training was provided on all outcome measures. For MVIC and MUNE, variability of measurement on four normal control subjects was assessed, with a criterion for acceptable intrarater variability set at less than 15% for MVIC and 20% for MUNE. Subjects were studied monthly for the 6 months of active treatment. At each visit, MVIC, MUNE, ALSFRS, grip strength, vital signs, physical examination, reports of concomitant medications, and adverse events were obtained. Safety blood and urine tests were performed at baseline, 3, and 6 months, and included blood creatinine and BUN, and urine glucose and protein. Urine for creatine measurement was collected at 3 months. Deaths (or tracheostomy) were reported as they occurred: either event was considered a survival endpoint. The sample size was based on the slope of the expected average decline in arm megascore. For 102 subjects, with 51 patients per group, power analysis showed an 80% chance of detecting a 50% decrease in the rate of decline at a two sided significance level of p = 0.05. Preliminary values for the rate of decline and its SD were obtained from prior studies.28,37⇓ A total of 104 patients were recruited into the study; 19 patients did not complete the study (6 patients in active treatment, 13 in placebo), with 8 study dropouts due to death (figure 1). Figure 1. Flow chart of research participants. The number of subjects completing the study and the number who withdrew for any reason are shown by treatment group assignment. Based on the intent to treat principle, the data set for analysis included all randomized subjects. The statistical analyses were performed according to the intention-to-treat principle. Analysis of the primary outcome variable used a mixed model analysis of variance, in the same manner as previously described for a study performed by our group.28 The dependent variable was the slope of the patient’s arm megascore measured at baseline and months 1 through 6. The independent variables were treatment, time, and a time-treatment interaction. The intercept and time variables were also modeled as random effects. The above analysis was repeated for the secondary outcome variables for efficacy. Secondary analyses were also performed, and included repeated measures analysis of variance, adjusted by time and baseline, as well as both Wilcoxon and t-tests comparing change from baseline to month 6 for all measures. Fisher’s exact test was used to compare treatment groups with regard to occurrence of adverse events and abnormal laboratory and vital signs. Weight change was analyzed using the mixed model analyses of variance described previously. Demographic variables and baseline variables were summarized descriptively for each treatment group. Discrete variables were compared using Fisher’s exact test, and continuous variables were compared using t-tests. Between September 5, 2000, and September 1, 2002, 104 patients were enrolled from 14 centers. The number of subjects enrolled at each center varied from 2 to 18. Fifty subjects were enrolled in the creatine group, and 54 in placebo. Demographic data and baseline outcome measures are shown in table 1; no statistically significant differences were noted in any baseline measure between treatment and placebo groups. Fifty percent of patients in the placebo group were on riluzole, as compared to 54% for the active treatment group: this difference was not statistically significant. The change in MVIC over time for placebo and treatment groups is shown in figure 2; treatment with creatine had no effect on the rate decline. Changes in ALSFRS-R and MUNE similarly were not affected by treatment (figures 3 and 4⇓). Of the eight deaths; observed on study, six were in the placebo group and two were in the creatine group. This difference was also not significant. Table 2 displays the p values for individual comparisons. None of the secondary statistical analyses showed significant differences for any outcome measure. Figure 2. Change in maximum voluntary isometric contraction (MVIC) arm Z score over time in patients treated with placebo (solid squares) and with creatine (solid diamonds). Vertical bars represent SEM. Figure 3. Change in ALS Functional Rating Scale (ALSFRS-R) scores over time in patients treated with placebo (solid squares) and with creatine (solid diamonds). Vertical bars represent SEM. Figure 4. Change in motor unit number estimation (MUNE) over time in patients treated with placebo (solid squares) and with creatine (solid diamonds). Vertical bars represent SEM. 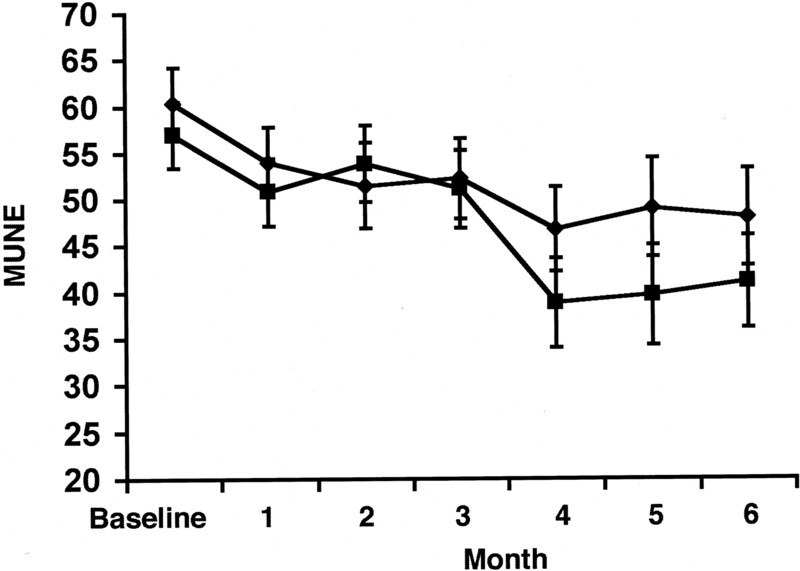 Figure 5 displays urinary creatine concentrations for placebo and creatine groups at baseline and 3 months. Treatment with creatine increased urinary concentrations by a factor of approximately 14. There was also a fourfold increase in urinary creatine in the patients on placebo at 3 months, most likely indicating noncompliance on the part of some subjects. Analysis of individual subjects showed that of the 68 subjects from whom urine was obtained at both baseline and 3 months, only 1 subject showed creatine concentration of more than 0.5 g/L at baseline. However, 6 of the 31 subjects in the placebo group who supplied urine collections had urine creatine concentrations of greater than 0.5 g/L at the 3-month time point. Conversely, however, 6 of 37 subjects in the creatine group had urinary creatine concentrations of less than 0.5 g/L at 3 months, indicating similar amounts of noncompliance in both treatment and placebo groups. To evaluate whether patient noncompliance affected results in a systematic fashion, patients in the placebo group with creatine concentrations >0.5 g/L and patients in the treatment group with creatine concentrations <0.5 g/L at the 3-month time point were excluded from the efficacy analysis and the primary analysis was repeated. There was no change in the pattern of results. Figure 5. Urinary creatine concentrations obtained from 24-hour samples at baseline and 3 months for patients receiving placebo and creatine treatments. Vertical bars represent SEM. Creatine was well tolerated. Both body weight and BMI declined over the course of the study, but the rate of change was not different for placebo and creatine groups (p = 0.22 for weight and 0.20 for BMI). There were no abnormal values for blood creatinine or BUN in either group. Thirty-one serious adverse events were reported. None were judged by the reporting investigator to be likely due to study medication, and no serious adverse event was observed more often in the creatine group. Of the events with a frequency of more than 1, there were 20 episodes of respiratory failure, 3 elective gastrostomy procedures, and 2 deep venous thromboses. No non-serious adverse event was recorded statistically more frequently in the treatment as compared to placebo group. Interpretation of results as a futility analysis. This study was powered only to detect a 50% or greater change in the rate of progression of ALS. As such, the failure to show a significant positive effect of treatment might have limited clinical significance. However, the power of a study can only be estimated prior to study performance, based on data from previous investigations. Once data are acquired, confidence intervals can be applied to place an upper boundary of the size of any real effect for any given outcome measure. For the four outcome measures MVIC, grip strength, ALSFRS-R, and MUNE, 95% CI were generated around the change in slope between placebo and treatment groups. For MVIC, one can state with 95% confidence that the true reduction in slope due to creatine is less than 23%. For grip MVIC, the effect is less than 19%, for ALSFRS, the effect is less than 48%, and for MUNE, the effect is less than 38%. Thus, despite the lack of power estimated at the start of the study, the results obtained allow for an estimate size of a true beneficial effect of creatine that is less than the level for which the study was initially powered. In this study, creatine at a dose of 5 g daily was well tolerated by ALS patients, but failed to show benefit over a 6-month period. This result is consistent with a recently reported study26 in which creatine at 10 g daily also showed no benefit. The lack of a positive effect in the face of encouraging preclinical studies raises a number of questions. With respect to directly comparing the human and mouse data, the two biggest differences in study design have to do with timing of drug administration and creatine dosage. 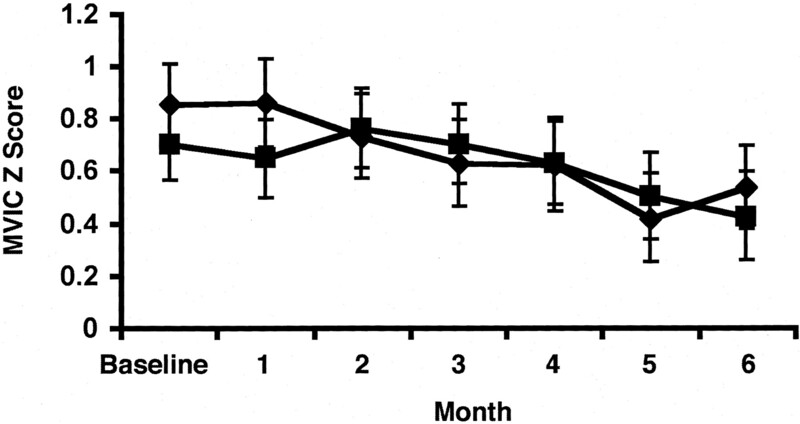 When fALS mice were fed a diet that was 2% creatine, life was prolonged by 26 days.23 A less dramatic but still significant effect was seen in animals supplemented with 1% creatine. These doses are of the same order of magnitude as those used in the current study as well as the recently reported study using 10 g daily. Using an estimate based on body surface area, 2% creatine by weight in a mouse diet roughly corresponds to 6 g per day human supplementation.38 However, since mice consume many more daily calories per unit weight than do humans, it is likely that the creatine dose used here is somewhat lower than the equivalent mouse dose shown to be effective. Perhaps more importantly, creatine supplementation in the mouse was started at day 70 of life, approximately 50 days prior to disease onset in the animals used. Such a treatment schedule in humans would require treating patients 10 to 20 years prior to the development of ALS related symptoms. More recent therapeutic studies in the fALS mouse have initiated treatment at disease onset, which may provide results more directly applicable to human trials. The trial was designed as an intent to treat study. Had creatine produced significant adverse events, this design choice had the potential to reduce power by including outcome measures from patients who had stopped taking study medication. However, given the lack of drug related adverse events, the primary reasons for patient dropout were death and disease progression. A secondary analysis excluding patients who (by urinary creatine measurements at month 3) were non compliant also did not change the results in a systematic way. Therefore, it is unlikely that the decision to use intent to treat affected our negative finding. The results of the urine creatine concentrations displayed in figure 5 also demonstrate an important and potentially confounding problem that must be confronted any time clinical trials are performed using agents that are generally available. It is clear that some patients assigned to the placebo group were in fact taking creatine and not reporting it. The effect of this is to reduce the power of the study; it is likely that patients in the active treatment group were also taking extra creatine, so that any differences produced by the study medication would be attenuated. Clinical ALS trials currently ongoing or planned involve the evaluation of Celebrex, minocycline, and coenzyme Q, all of which are available either by prescription or over the counter, so the problem we encountered will likely recur in these studies as well. In addition, it is likely that patients in a clinical trial testing one agent may be taking other medications which are available by prescription but which are experimental with respect to their effect on ALS. Power calculations for future studies should take this into account. Despite the negative results, however, results of this study are interesting in several respects. First, this study was initially conceived to detect a change in disease progression of 50% or greater, clearly a high standard to reach. However, the data as obtained render an effect in the primary outcome measure of greater than 23% very unlikely, through the use of CI. This finding suggests that small trials that are apparently underpowered may still be of use in screening potentially interesting compounds, allowing for more rapid screening of a greater number of potentially useful agents. The NEALS Consortium members participating in this trial include the following: Participating coordinators and clinical evaluators—C.L. Bagley, MA, T. Conrad, M. Chilton, MA, J. Taft, PA-C, SUNY Upstate Medical University; S. Hilgenberg, L. Urbinelli, Massachusetts General Hospital; J. Florence, C. Harper, J. Schierbecker, Washington University; G.P. Hyde, S. Hinkle, B. Freiberg, Wake Forest University; D. Padgett, C. Foley-Schwartz, Mayo Clinic; J. Steele, B. Fitzgerald, University of Miami; J. Mass, University of California, San Francisco; T. Wheeler, D. Andrews-Hinders, K. Levin, A. Kloos, Cleveland Clinic; L. Hass, A. Michaels, Indiana University; C. Cook, T. Paylor, Y. Suh, MCP–Hahnemann University; P. Krusinski, S. Barsotti, University of Vermont; M. Del Bene, S. Hayes, Columbia Presbyterian Medical Center. Steering Committee—J. Shefner (principal investigator), SUNY Upstate Medical University; M. Cudkowicz, D. Schoenfeld, MA General Hospital; J Rothstein, Johns Hopkins University. Safety Monitoring Committee—D. Schoenfeld (Chair), Massachusetts General Hospital; E. Logigian, University of Rochester; B. Jubelt, SUNY Upstate Medical University. Supported by the Muscular Dystrophy Association, The ALS Hope Foundation, and Avicena Pharmaceuticals. ↵*Members of the NEALS Consortium are listed in the Appendix on page 1660. Bensimon G, Lacomblez L, Meininger V. A controlled trial of riluzole in amyotrophic lateral sclerosis. N Engl J Med. 1994; 330: 585–591. Trotti D, Rolfs A, Danbolt NC, et al. SOD1 mutants linked to amyotrophic lateral sclerosis selectively inactivate a glial glutamate transporter [published erratum appears in Nat Neurosci 1999;2:848]. Nat Neurosci. 1999; 2: 427–433. Rothstein JD, Dykes-Hoberg M, Pardo CA, et al. Knockout of glutamate transporters reveals a major role for astroglial transport in excitotoxicity and clearance of glutamate. Neuron. 1996; 16: 675–686. Ferrante RJ, Browne SE, Shinobu LA, et al. Evidence of increased oxidative damage in both sporadic and familial amyotrophic lateral sclerosis. J Neurochem. 1997; 69: 2064–2074. Robberecht W. Oxidative stress in amyotrophic lateral sclerosis. J Neurol. 2000; 247 Suppl 1: I1–6. Rouleau GA, Clark AW, Rooke K, et al. SOD1 mutation is associated with accumulation of neurofilaments in amyotrophic lateral sclerosis. Ann Neurol. 1996; 39: 128–131. Julien JP, Mushynski WE. Neurofilaments in health and disease. Prog Nucleic Acid Res Mol Biol. 1998; 61: 1–23. Julien JP, Couillard-Despres S, Meier J. Transgenic mice in the study of ALS: the role of neurofilaments. Brain Pathol. 1998; 8: 759–769. Masui Y, Mozai T, Kakehi K. Functional and morphometric study of the liver in motor neuron disease. J Neurol. 1985; 232: 15–19. Nakano K, Hirayama K, Terai K. Hepatic ultrastructural changes and liver dysfunction in amyotrophic lateral sclerosis. Arch Neurol. 1987; 44: 103–106. Sasaki S, Iwata M. Ultrastructural change of synapses of Betz cells in patients with amyotrophic lateral sclerosis. Neurosci Lett. 1999; 268: 29–32. Hirano A. Cytopathology in amyotrophic lateral sclerosis. Adv Neurol. 1991; 56: 91–101. Ro LS, Lai SL, Chen CM, Chen ST. Deleted 4977-bp mitochondrial DNA mutation is associated with sporadic amyotrophic lateral sclerosis: a hospital based case-control study. Muscle Nerve. 2003; 28: 737–743. Bruijn LI, Beal MF, Becher MW, et al. Elevated free nitrotyrosine levels, but not protein-bound nitrotyrosine or hydroxyl radicals, throughout amyotrophic lateral sclerosis (ALS)–like disease implicate tyrosine nitration as an aberrant in vivo property of one familial ALS-linked superoxide dismutase 1 mutant. Proc Natl Acad Sci USA. 1997; 94: 7606–7611. Dal Canto MC. Comparison of pathological alterations in ALS and a murine transgenic model: pathogenetic implications. Clin Neurosci. 1995; 3: 332–337. Kong J, Xu Z. Massive mitochondrial degeneration in motor neurons triggers the onset of amyotrophic lateral sclerosis in mice expressing a mutant SOD1. J Neurosci. 1998; 18: 3241–3250. Wong PC, Pardo CA, Borchelt DR, et al. An adverse property of a familial ALS-linked SOD1 mutation causes motor neuron disease characterized by vacuolar degeneration of mitochondria. Neuron. 1995; 14: 1105–1116. Hemmer W, Wallimann T. Functional aspects of creatine kinase in brain. Dev Neurosci. 1993; 15: 249–260. Beutner G, Ruck A, Riede B, Brdiczka D. Complexes between porin, hexokinase, mitochondrial creatine kinase and adenylate translocator display properties of the permeability transition pore. Implication for regulation of permeability transition by the kinases. Biochim Biophys Acta. 1998; 1368: 7–18. Schinder A, Olson E, Spitzer N, Montal M. Mitochondrial dysfunction is a primary event in glutamate neurotoxicity. J Neurosci. 1996; 16: 6125–6133. White R, Reynolds I. Mitochondrial depolarization in glutamate-stimulated neurons: an early signal specific to excitotoxin exposure. J Neurosci. 1996; 16: 5688–5697. Lawler JM, Barnes WS, Wu G, et al. Direct antioxidant properties of creatine. Biochem Biophys Res Commun. 2002; 290: 47–52. Klivenyi P, Ferrante RJ, Matthews RT, et al. Neuroprotective effects of creatine in a transgenic animal model of amyotrophic lateral sclerosis. Nat Med. 1999; 5: 347–350. Zhang W, Narayanan M, Friedlander RM. 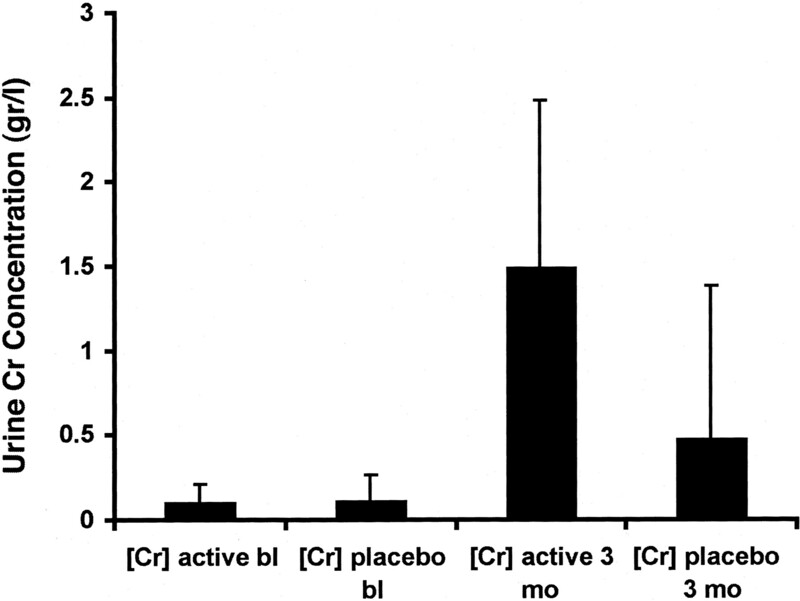 Additive neuroprotective effects of minocycline and creatine in a mouse model of ALS. Ann Neurol. 2003; 53: 267–270. Snow RJ, Turnbull J, da Silva S, et al. Creatine supplementation and riluzole treatment provide similar beneficial effects in copper, zinc superoxide dismutase (G93A) transgenic mice. Neuroscience. 2003; 119: 661–667. Groeneveld GJ, Veldink JH, van der Tweel I, et al. A randomized sequential trial of creatine in amyotrophic lateral sclerosis. Ann Neurol. 2003; 53: 437–445. Brooks B. El Escorial World Federation of Neurology criteria for the diagnosis of amyotrophic lateral sclerosis. Subcommittee on Motor Neuron Diseases/Amyotrophic Lateral Sclerosis of the World Federation of Neurology Research Group on Neuromuscular Diseases and the El Escorial “Clinical limits of amyotrophic lateral sclerosis.” J Neurol Sci. 1994; 124 (suppl): 96–107. Cudkowicz ME, Shefner JM, Schoenfeld DA, et al. A randomized, placebo-controlled trial of topiramate in amyotrophic lateral sclerosis. Neurology. 2003; 61: 456–464. Andres PL, Thibodeau LM, Finison LJ, Munsat TL. Quantitative assessment of neuromuscular deficit in ALS. Neurol Clin. 1987; 5: 125–141. Andres PL, Hedlund W, Finison L, et al. Quantitative motor assessment in amyotrophic lateral sclerosis. Neurology. 1986; 36: 937–941. Ohashi Y, Tashiro K, Itoyama Y, et al. [Study of functional rating scale for amyotrophic lateral sclerosis: revised ALSFRS (ALSFRS-R) Japanese version]. No To Shinkei. 2001; 53: 346–355. Cedarbaum JM, Stambler N, Malta E, et al. The ALSFRS-R: a revised ALS functional rating scale that incorporates assessments of respiratory function. BDNF ALS Study Group (Phase III). J Neurol Sci. 1999; 169: 13–21. Daube JR. Estimating the number of motor units in a muscle. J Clin Neurophysiol. 1995; 12: 585–594. Lomen-Hoerth C, Olney RK. Comparison of multiple point and statistical motor unit number estimation. Muscle Nerve. 2000; 23: 1525–1533. Olney RK, Yuen EC, Engstrom JW. Statistical motor unit number estimation: reproducibility and sources of error in patients with amyotrophic lateral sclerosis. Muscle Nerve. 2000; 23: 193–197. Shefner JM, Jillapalli D, Bradshaw DY. Reducing intersubject variability in motor unit number estimation. Muscle Nerve. 1999; 22: 1457–1460. Miller RG, Moore DH, Gelinas DF, et al. 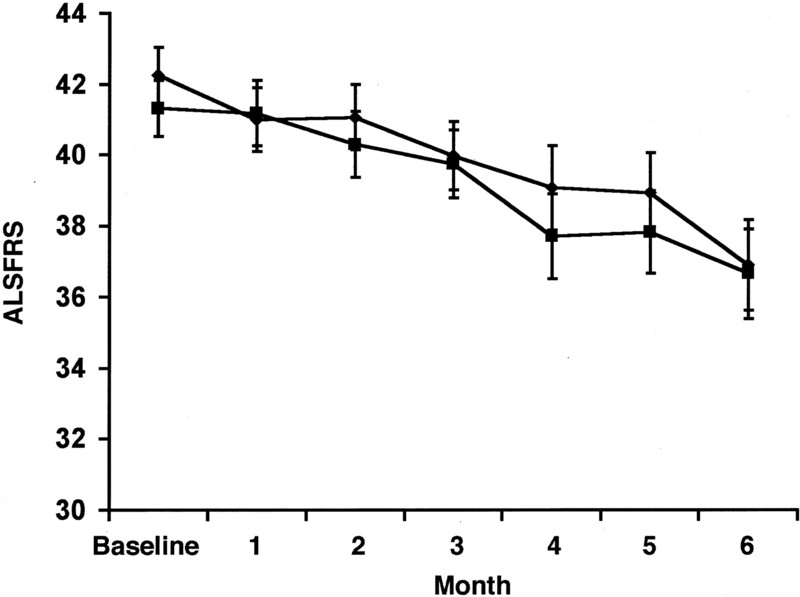 Phase III randomized trial of gabapentin in patients with amyotrophic lateral sclerosis. Neurology. 2001; 56: 843–848. Osterberg R, Green M. Guidance for industry and reviewers: estimating the safe starting dose in clinical trials for therapeutics in adult healthy volunteers. Rockville, MD: US Department of Health and Human Services, Center from Drug Evaluation and Research, 2002. Shefner J, Cudkowicz M, Zhang H, et al. The use of statistical MUNE in a multicenter clinical trial. Muscle Nerve 2004 (in press).